Obviously I am not being as productive as one could be for this time of year. Yet my friends have requested my services in their creative ideas. We are making very large river maps. We all live on the river and knowing your way around can be dangerous at times. Navigational hazards like 6-7 mile long stretch of river full of shoals create jokes among the locals. River rats swear they move in the night, rearranging themselves intentionally. So we are making maps for the river houses, so we can navigate and show others our neighborhood routes. See the splicing two maps together. 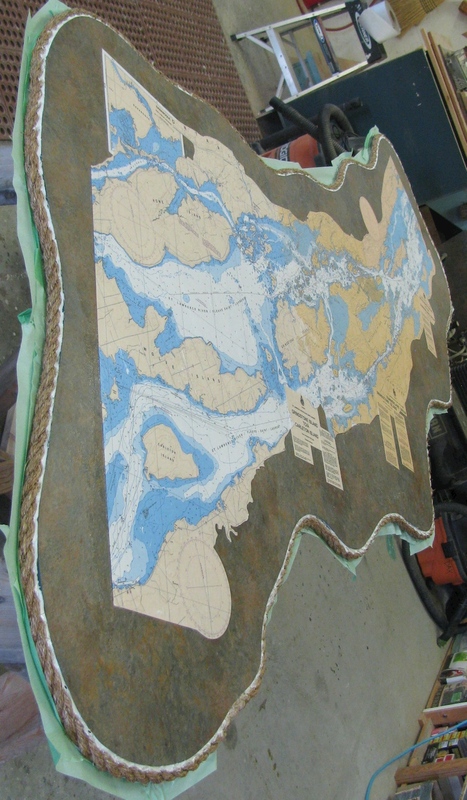 Initially I was handed three rather large maps, which had to be cut, pieced together and measured. 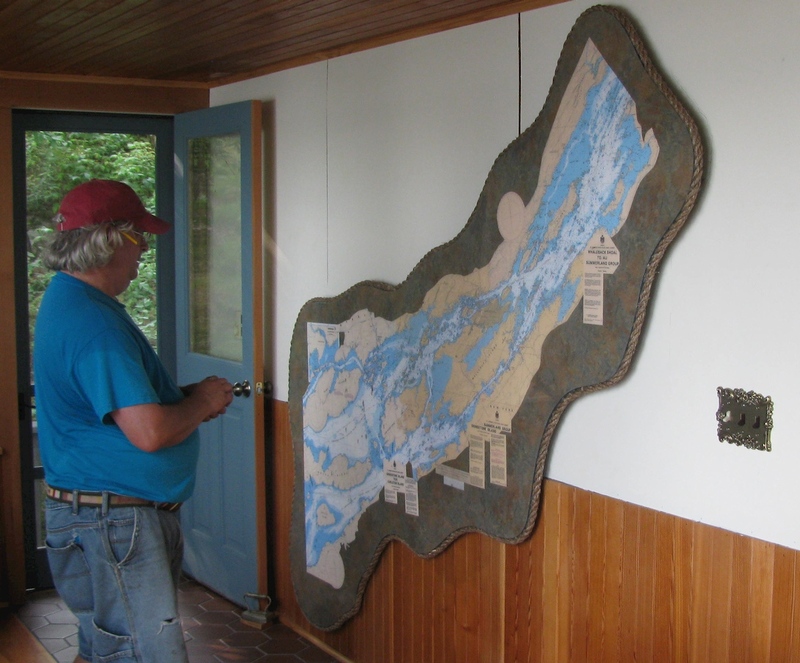 The end result was one map reaching 109 inches across and at the widest point 48 inches across. We had to get creative with our materials finding; finding a ten foot surface that could hang on a wall within reasonable weight took some thinking. We went with wooden counter top, covered in veneer with a three inch border around the maps edge. The map was decoupaged to it surface, the back and edges painted and sealed for protection. The edges we trimmed with a natural fiber rope, due to the chosen color scheme we came up with and secured with brass finishing nails. 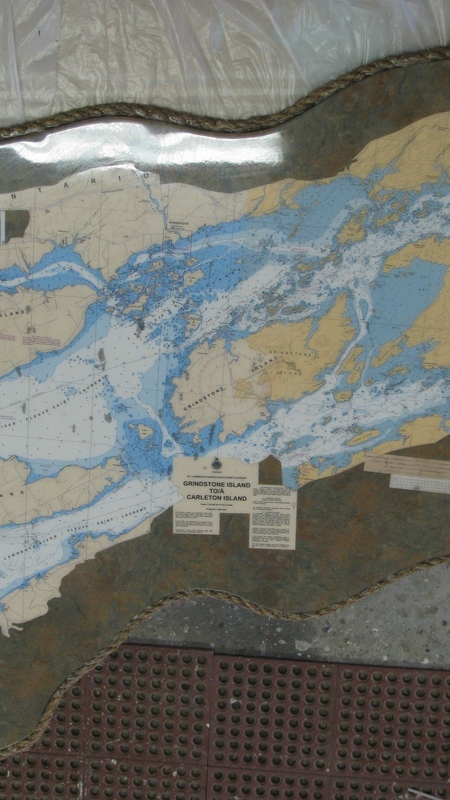 The two part epoxy was the final finish, which increased the readability of the map’s many marks and numbers. We went with a notched hanging system on the back, which gave us a two inch spacer off the wall. The cost in materials ran near three hundred dollars. The artist fee was too reasonable because there was a large learning curve for my first one. Overall everyone was satisfied with the end product, it was very nice. ← To Make A New Appearance, To Be Refurbished.